Winsor & Newton isn't the first name that comes to mind to most miniature painting enthusiasts when they're looking for a brush. However, it should be on their list of companies who make great brushes for painting miniatures. W&N has been around since 1832, that's over 175 years of catering to artists and painters in general. I had heard that they made some brushes that were ideal for miniature painting a few years back, but didn't get around to looking into it until now. All of the Winsor & Newton stuff that I ever saw at arts and craft stores we're usually expensive, and none of the craft stores I have ever been to carried most of the products I'm here to review today. So they were easy to overlook, until now. As you can see, the Series 7 is pretty much their flagship product. There was also a little tidbit in their background info on the Series 7 that mentioned when the remains of the Titanic was rumaged through, a Series 7 brush had been found. They claim the brush head looked like it was bought just yesterday. That's a hard to swallow, but just finding one alone in the remains is an impressive bit of info to be able to claim for any company. 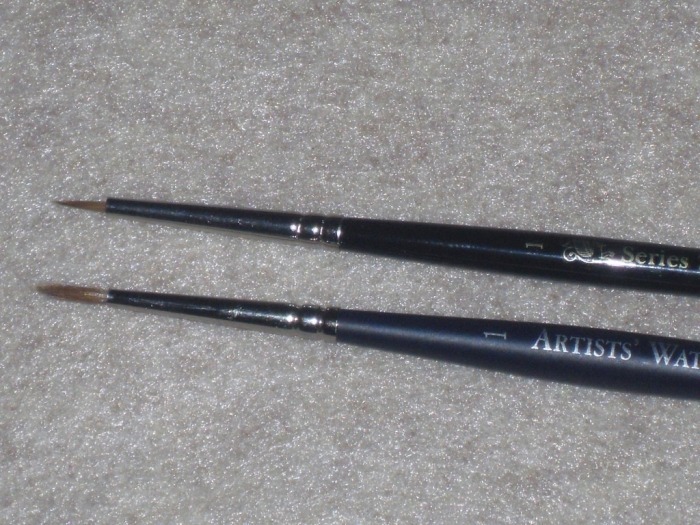 There are two different Series 7 brush types, Round and Miniatures. Round is the regular tip, and Miniatures is a shorter tip. So the term Miniatures doesn't mean that these are designed for painting miniatures either, it's by total coincidence that they happen to be high-end Kolinsky Sable brushes, which is exactly the type of brush that's ideal for painting miniatures. I should also add that these brushes were designed specifically for water colors, not acrylics, however, the majority of the paints we use for painting miniatures are water based acrylics, usually in quite thin watered down consistencies. Series 7 is Winsor & Newton's finest Kolinsky Sable brush line. Other notable features include rust-proof, seamless nickel plated ferrules with black polished handles. The Series 7 Miniatures line is made in a variety of sizes, as big as size #6, and as small as a #000. Cost wise these aren't cheap, but they aren't cheaply made either. If you dig around their website, there's an entire section detailing how much love is put into the manufacturing of these hand-made brushes. Visually step by step, pictures and all, it's impressive to say the least. So this is not a mass machine produced product, the standard for quality is set very high. Each brush tip is shipped with a clear plastic straw protector like we're used to seeing on brush tips, plus they're packaged in a clear tube on top of that. 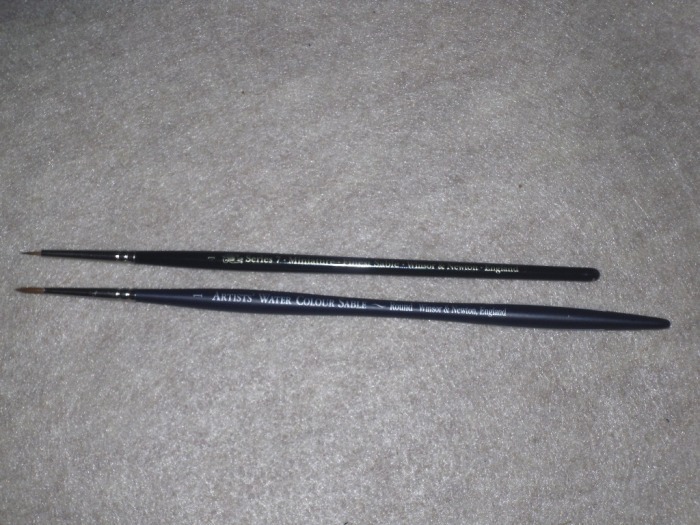 The larger sized brushes come with a tag that is placed into the box with the brush, indicating the name of Series 7 brush maker who has made that particular brush even. That's extreme attention to detail in the manufacturing process. Lets talk cost. The larger the brush, the more hair used, thus the higher the cost. I did some digging around online to price them, and on average a #6 can cost as much as $30-$35, while the #000 thro #2 brushes range about $10-$13 each. That positions the Series 7 in direct competition price-wise with Reaper, Privateer Press and Vallejo's Kolinsky Sable brushes. Depending on where you shop, at most a Series 7 could cost $1-$2 more, but in most cases they're about the same price. We as miniature painting enthusiasts will never need much larger than a #2 either. I personally rarely use anything bigger than a #1. If I need to paint vehicles and large pieces, I simply use a cheaper $5 or less variety brush, and I don't paint vehicles and larger pieces very often. The tip of these are a wee bit shorter than the average miniature painting brush from the competition, as most miniature painting brushes tend to be a little longer, and even the Round variety Series 7 look to be fatter, but equally as long as most others. So these in appearance are a slightly different than the norm. In use, it doesn't seam to affect the performance. The Round tips are also designed this way on purpose, so they can carry more paint. So for doing ink washes the Round tips would work really well. I've spent a lot of time with these brushes now, and I have to admit, they work extremely well, as they carry the paint well, and hold an amazing point as advertised. With proper care, a Series 7 brush is said to last a lifetime too. 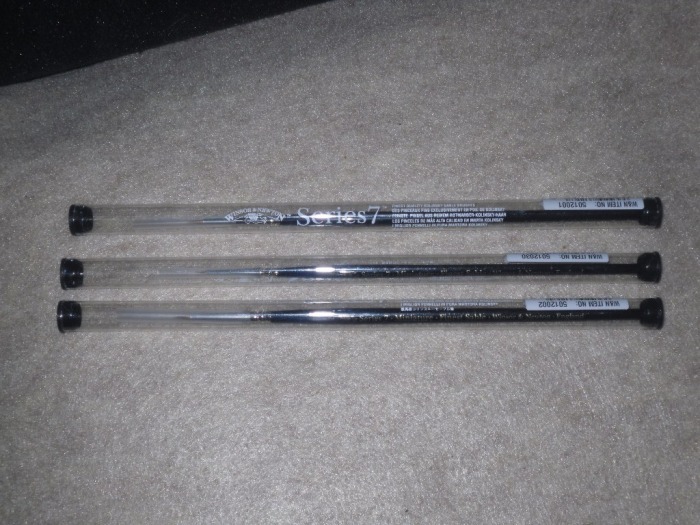 A #000, #0 and a #1 that I've been sent for review is what I've based my experience with the Series 7 Miniatures brushes on. I really can't find a thing to complain about, aside from I wish they made some smaller sizes. Although, I have been able to do some things with the #000 that would usually require a smaller size brush from the competition. Another product that Winsor & Newton offers is the Artists Water Color Sable series. Once again, as the name implies, these are designed for water colors, but work great with the water-based acrylics we as miniature painters utilize most. 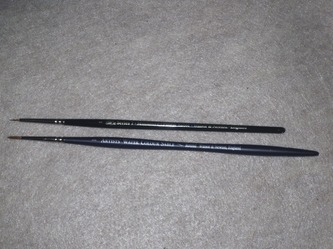 These brushes are also designed utilizing Kolinsky Sable hair. The handle is different than the Series 7, as these offer a more contoured Birchwood handle in a matte finish, and is longer than the Series 7, but also with a seamless nickel ferrule. This is a less expensive alternative to the Series 7 line, as I've found these priced considerably less than the Series 7 line. Actually I've found that the Artists Water Color Sable line is priced less than most other Kolinsky Sable brushes from most other miniature paint companies like Reaper, Privateer Press and Vallejo as well! 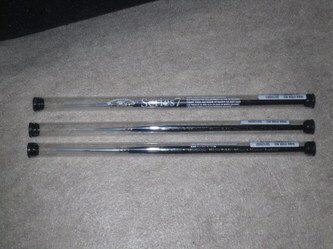 On average I've found the #00, #0 and #1 brushes that were sent to us for review, were priced at $5 or less each online. 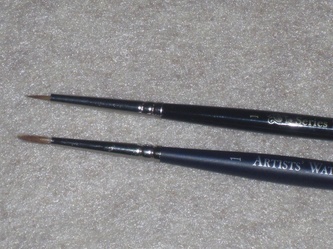 That's about $4-$6 less than most of the Kolinsky Sable brushes from the competition. In use I can't find anything bad to say about them. They hold a point nicely, and work just as well as any other specially designed for miniatures Kolinsky Sable brush that I've used in the past. The handles are longer than the Series 7, and other brushes that I use on a regular basis, but I didn't find that it was a problem. As crazy as it sounds, one could easily clip them down to a shorter size as needed too I'm sure. We as miniature, and wargaming hobbyists aren't at all afraid to modify things to our liking. I also found the contour handles to be quite comfortable to use as they are. 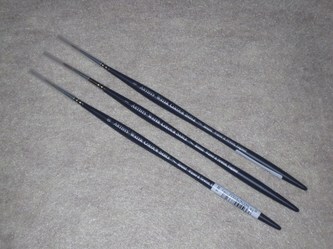 These brushes we reviewed in the Artists Water Color Sable line feature the Round tip, but the Artists Water Color Sable series offers Round, Pointed Round, Rigger and One Stroke tip varieties. There's a little more to choose from tip-wise in this series, but overall the Round I think works best. The Pointed Round looks thinner, and while the point looks to be a hair sharper...they don't come in anything other than #3-#8 sizes. This is why I requested the Round to begin with, because all of the other styles don't look to be appropriate for miniature painting. 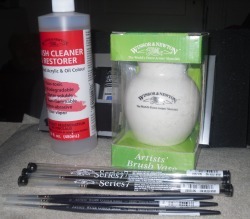 Winsor & Newton also offers a wide variety of other brushes and art supplies, and I've been using their Brush Cleaner & Restorer in particular with excellent results. It's non toxic, biodegradable, water soluble, non-flammable, non abrasive and is low vapor. It's made for oil and acrylics both. Up until now I used some cheaper brush cleaner alternative from Michaels craft store, which seamed to work well. In comparison, this stuff is about $2.00 more than the stuff I was previously using per 4oz bottle, and the 16oz bottle they sent along, runs about $7-$8 online. So it's by far the wiser choice per oz, as the 4oz bottles run about $4-$5 per bottle, and you get 3X as more for a few dollars more by opting to get the 16oz bottle. This 16oz bottle should last quite a long time too. They had also sent along some of their Artists' Acrlic paints. Of all the items we've looked at from them, this is the only product that I just can't recommend for miniatures. The paints we use for miniature painting is designed specifically for miniatures, and that's usually a paint of a much thinner consistency than the average acrylic paint from a tube. It's not to say this isn't a good product. 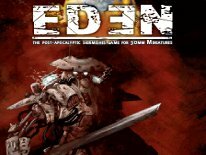 I'm sure it's probably one of the best "artists'" acrylic paints money can buy for painting pictures on canvas and what not, but for miniatures we require a more specialized paint. With some thinning I'm sure I can make use of this stuff, as it looks to have strong pigment, and it would probably thin down nicely, but it's not designed with miniature painting in mind, and I'm still more inclined to use my Vallejo, Reaper and Games Workshop paints over this. It's clear now that Winsor & Newton does have some products that can benefit the miniature painting enthusiast. The Series 7, and Artists Water Color Sable lines are unquestionably some of the very best brushes that money can buy for painting miniatures with the specifically designed water based acrylic paints that we use. I'm also sold on using their Brush Cleaner & Restorer now too. It costs a little more than the stuff I was using, but when I run out of this, I'll have a hard time not buying more of it. It's that useful. My only complaint is that they don't make smaller sizes. Being a miniature painting enthusiast, we sometimes require a #5/0, or #10/0 brush for some extremely fine details, and at present Series 7 stops at #3/0, and Artists Water Color Sable ends at #2/0. They should really consider making smaller sizes, as I'm certain that miniature enthusiasts would buy them up without thinking twice about it. I know that Reaper makes a #40/0, which I think is a bit extreme, but I find that I can consistently make use of a #10/0 for details like eyes. So at the very least a #10/0 Series 7 or Artists Water Color Sable would be nice. It should also be said, that if you own nice brushes, and want them to last, proper cleaning and care is an absolute must. Winsor & Newton also sent along one of their brush vases, and I can't stress enough how essential is it to keep your brushes stored upright to dry, which also helps them retain a point when not in use too. I already use a fine bone china collectible Star Trek VI: The Undiscovered Country stein from Pfaltzgraff, that resembles the steins used in the movie to store all of my brushes upright for years now. But the vase they offer looks nice, and isn't terribly expensive. Actually I'm sure it costs less than my 1990s era Star Trek collectible mug. lol A brush vase, stein or cup is a must. If you don't have one, get one. I also think that the Artists Water Color Sable line of brushes, may be by far the most affordable name brand option out there in Kolinsky Sable brushes that I'm aware of now. I've used the Reaper and Vallejo brushes a lot over the years, and I can't really say a bad thing about them, but I believe these Artists Water Color Sable brushes, are just as good, at half the cost. Of course if money is no object, don't think twice, get some Series 7 Miniatures brushes. There's something to be said about being hand-made, and few others make this kind of effort, and invests this much time into making and selling paint brushes other than Winsor & Newton. In all fairness, I can't say they're the #1 option out there, because there are still a few products, that I haven't seen first-hand yet from other companies. I'll remedy that very soon tho. However, it's clear now that Winsor & Newton is definitely up there in the top 5, and they've stepped up to the plate with two very strong lines of brushes, both of which are definitely ideal for miniature painting.